Everything you need to know about hiring a Celebrant for your wedding! Weddings are probably at the top of the list amongst our happiest memories. They are a part of the journey we take in life, whether for ourselves, or with others. They are one of the major milestones in our lives, and to do them justice, I believe we all want to mark those days forever in our minds and hearts with a beautiful and joyous ceremony. What most couples want is to hold a ceremony that realises their most cherished desires and dreams, and today more couples choose a non-religious ceremony, sometimes as a compromise if they have different faiths, but more frequently because they are not regular church-goers. In the past, their only other option was to hold a Civil Ceremony for your marriage, in a location registered by the council to perform the legalities. This will then be either at the Town Hall, or in one of the 4000 venues which are licensed for marriages. Unfortunately, a Registry office is not always a personal or romantic environment, and as couples are making a legal contract, they must abide by several rules regarding the ceremony itself and where it is held. The Registry must be of solid construction with four walls and a ceiling, therefore an outdoor ceremony is out of the question. The Registrar will want to vet your vows and music and any readings beforehand, as no religious or spiritual content is allowed. The cost of two officers of the council coming to the venue is usually in addition to the venue hire cost and can be in the region of £500 to £600 depending on the day and time of the marriage, as opposed to around £60 - £70 at the Registry Office. So what options do couples have if they want a Ceremony full of their own style and ideas, performed say at sunrise, or dusk, outside, in a beautiful romantic setting such as a country house with a beautiful garden, a favourite spot in a wood, or even on the beach? Hiring a Celebrant is the answer as they alone can provide the freedom, flexibility, and innovation that couples want when celebrating this major occasion with their closest family and friends. A Celebrant can provide a totally unique ceremony – be that along traditional lines or perhaps your Star Wars/Disney/Harry Potter/Game of Thrones theme, and include ancient rituals such as a Hand Fasting or Jumping the Broom element! Every Celebrant led ceremony is unique. Internal ceremonies such as Rose, Sand or Unity Candle Lighting Ceremonies are delightful and novel and allow couples to express themselves exactly how they wish – and frequently children can be included in this type of Ceremony too. 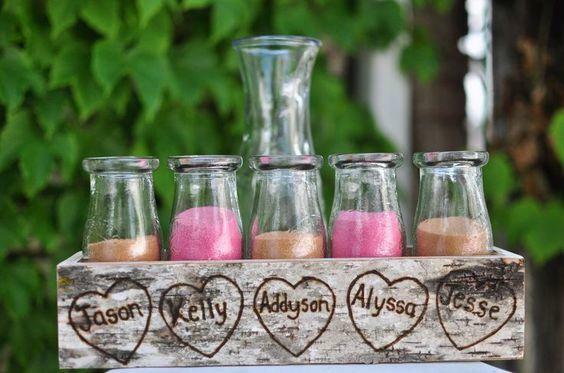 The Sand Ceremony allows for each person to have a different coloured sand, which is poured into a glass vase and kept as a memento of the day the couple or family were united. The layers show the individuality of each person, but they also show the unbreakable bond between them, as once, poured, the layers can’t be separated. The paperwork can be done quietly and without fuss on a day earlier in the week, with just two witnesses, couples can go to the local Registry Office and say the 32 “contracting words” that legally bind them. The cost is a fraction of the fees charged at their venue, and also really reduces the pressure on couples as they relax and look forward to their Celebrant-led ceremony! 1. Decide if you want a Humanist Celebrant or an Independent/Civil Celebrant. Humanists do not believe in religion or spirituality and therefore their ceremonies will not allow “blessings” or any religious or spiritual content in vows, readings or music. If you choose a Civil Celebrant, then they will be able to match all your wishes for religious or spiritual content, conferring blessings on the couple, on their rings and will happily advise on spiritual and religious content for vows, blessings, and readings. 2. Check the credentials of your Celebrant! There are a number of institutions and organisations that train and accredit Celebrants, and offer ongoing support and guidance and training so that their Celebrants remain up to date, and totally professional. Ensure your Celebrant has up to date insurance – Public Liability and Professional Indemnity Insurance is key. They should also be able to show you their Terms and Conditions so that for example should they not be able to attend on your day, there is a plan in place for a substitute Celebrant from the same institution to take charge. 3. Meet your Celebrant! Some people only meet their Celebrant on the day of their wedding. I would advise meeting in person and talking through your ideas and style and ensure you are making a connection with the Celebrant. An initial meeting by skype or face to face can really help a couple to decide they are choosing the right person to work with and with whom they will be creating this important, personal ceremony. 4. Ask your Celebrant for testimonials and reviews from other couples – established Celebrants will, of course, have many clients and ceremonies which they can discuss and from whom they will have received feedback. 5. Allow your Celebrant to advise on creative ideas, themes, ritual and choreography – most celebrants are very experienced and can offer some great suggestions. In particular, they will be able to advise on a number of different internal ceremonies such as Hand Fasting, Ring Warming, Wine or Beer Ceremonies, to name but a few. Vows and Promises are key to the ceremony and a Celebrant will be able to assist with ideas and suggestions so that the couple feel they really are having their day, their way, and true to their love story and beliefs. 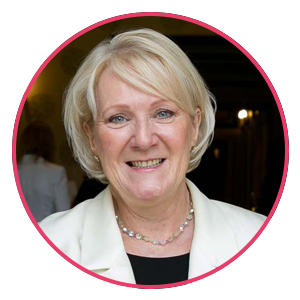 Yvonne is a Marriage and Family Celebrant, a member of the Fellowship of Professional Celebrants, since qualifying in 2011. She is available for weddings, vow renewals, baby namings and funerals and provides ceremonies for couples and families across England.